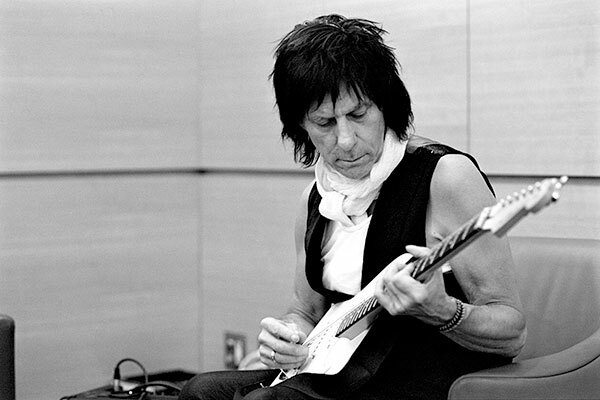 LOS ANGELES – For his first studio album in seven years, Grammy-winning guitarist Jeff Beck returns with an eclectic mix of tracks that find the guitar virtuoso accompanied by a handpicked cast of talented musicians, as well as several songs accompanied by a 64-piece orchestra. Rhino unleashes the Rock and Roll Hall of Famer’s restless genius with EMOTION & COMMOTION. The album will be available on Atco Records, an imprint of Rhino Entertainment, on April 13 at all retail outlets, including www.rhino.com, for a suggested list price of $18.98 (CD) and $9.99 (digital). Beck recorded EMOTION & COMMOTION late last year at Sarm Studios in London with award-winning producers Steve Lipson and Trevor Horn. To create the album’s diverse sound, Beck used a number of musicians, including appearances by frequent collaborators Vinnie Colaiuta (drums), Jason Rebello (keyboards), and Tal Wilkenfeld (bass). The album also includes contributions from a trio of singers: Imelda May (“Lilac Wine”), Olivia Safe (“Elegy For Dunkirk”), and Grammy-winner Joss Stone (“I Put A Spell On You” and “There’s No Other Me”). In addition to the orchestral pieces, EMOTION & COMMOTION showcases a number of original compositions. For “Hammerhead,” Beck fires the rocker’s opening salvo through his wah-wah pedal before falling into a deep groove carved out by the rhythm section and horn arrangement. At the opposite end of the sonic spectrum, the airy arrangement that elevates “Never Alone” provides a wide-angle soundscape for Beck’s imagination to freely explore the high-flying melody. Before launching a world tour to support EMOTION & COMMOTION, Beck will unite with Eric Clapton in February for a series of exclusive shows in London, New York City, Toronto, and Montreal. The guitarists—both former members of the Yardbirds—will play separately before taking the stage to perform together. For Beck, the new album and tour follows in the wake of a triumphant 2009—his most successful year ever. Among the many highlights were a sold-out world tour; his second induction into the Rock and Roll Hall of Fame; the release of the platinum-selling Performing This Week… Live At Ronnie Scott’s, which earned a Grammy nomination for “A Day In The Life”; and magnificent performances with his band at the 25th Anniversary Concert of the Rock and Roll Hall of Fame at Madison Square Garden. For additional information regarding EMOTION & COMMOTION, please contact Melissa Dragich-Cordero at MAD Ink, PR (310) 547-1212 or MelissaDragich@aol.com or Jason Elzy at Rhino at (818) 238-6220 or jason.elzy@rhino.com.